Merry Christmas and happy holidays to all of our community members! No matter where in the world you are, the Minecraft Frontiers team wishes you only the best this Christmas. Remember to relax and spend time with your friends and family. After all, that's what Christmas is about. 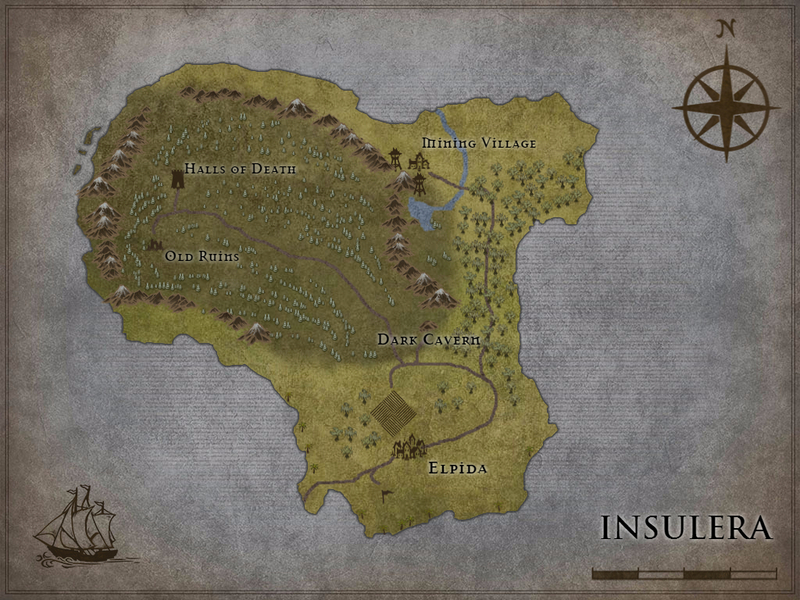 Elpida is located on the island of Insulera. Though the Elpidan's have good control over the greenlands, the snowy forests are much less explored. The island itself offers several unanswered mysteries. For one, sudden changes in temperature are not uncommon. Travelling researchers have tried explaining the strange weather patterns with no success. Secondly, barbarians regularly launch attacks on Elpidan trade caravans. They are not native inhabitants, as there was no such thing when Insulera was first discovered. The source of their attacks is not apparent. So far, no barbarian encampment has been found with the exception of a few small tents in the forests. The island only has one known town - Elpida. The mining village acts as a supply space for Elpidan miners to store their tools. It is not perceived as an autonomous village, but rather as a district extending Elpida's reach. A couple points of interest are worth noting. The Dark Cavern provides some basic minerals and is located very close to the center of the town. Travelling up into the mountains, one can find remnants of old ruins, possibly used for ancient rituals. Not far north, the "Halls of Death" hide in a valley. This peculiar structure is unlike anything else on the island, possibly used as a burial ground. Little is known about those buried there. So you are here looking for something interesting and new? You are in the right place! Read on and get to know our idea - an idea that will not only completely change the way people play Minecraft, but will bring back what many videogames are missing. I'm Tom, 23 years old, studying Psychological Research (you know, reading people's mind and stuff). I love a good story, enjoy games and meeting people from all walks of life. The number one thing that makes games fun for me is immersion - if it can make me believe I am there for just a minute, I'm sold (@Tomas). Quite a few people were interested in my idea and now we have a team of about 14 people working on and off, trying to deliver this beast of a project! We have Matt, a champion at everything from organizing staff to managing plugins. Our awesome builders, who have been placing blocks into some pretty neat formations (screenshots below!). We have a couple of lore writers thinking up impressive stories that are both original and make sense. It's all blending together great - and there is always space for new talent. So that's our passionate team, here to create a bold new frontier. Think of an RPG server with classes, quests, levels and a storyline that guides your character from a nobody to the savior of the world. Now throw that idea out the window! When we sat down to design this experience, it was instantly obvious that majority of games out there are the same old thing, just slightly different settings. Our goal is to make a player experience that is like nothing you've played before. We call it a living universe. What is a living universe? Plays on its own - it lives without the need for a single player. Farmers plant crops to make a living. Bakers buy the wheat and sell their bread to others in the marketplace. Politicians make big decisions for citizens and collect taxes. Warriors explore the wilderness and defend trade caravans. It is constantly interacting with itself, resulting in a completely dynamic experience. Smart NPCs - so the above sounds like the smartest NPC system there could be, right? Well there is more. NPCs chat with each other, share their experiences and knowledge. Did a thief steal from a caravan on the other side of town? Well the other trader won't know about it - unless someone told him! The goal is for each NPC to have a meaningful life, making decisions on a daily basis - possibly being "smarter" than most players! Expanding towns - if a city prospers and the villagers are happy enough to make love, politicians will start thinking about expanding the town. If you don't log in for a month of two, chances are you will come back to a very different place - full of new buildings not created by the admins, but planned and built by the NPCs! Dynamic economy - the town economy goes beyond supply and demand. If warriors bring back rare weapons, the old iron daggers will drop in value - but that's not it by far. A player set up a new bakery that makes tastier and cheaper breads than the old bakery in town? Locals will quickly realise and start enjoying the new yummy breads. Shame on the old greedy baker who is now out of a job! So we have a world that lives on its own. Where does the player come in? That is the beauty of it all. You log in and have a meaningful decision to make! Who will you be? There are literally hundreds of possibilities and our team is here to let you be who you want to be. Through systems promoting role-play and interaction, we let you blend into the already living world. You not only get to explore this rich universe, but since everything is dynamic, you also get to change it! Things you do and the way you spend your time really makes an impact. No more RPGs where you log in with level 1, stop playing a month later and no single soul cares. As soon as you log in, the world has already changed! Write your own lore - and if you ever get in trouble, don't be surprised the elected senator can dig the local library to find out records on your character. Own valuable property - no endless plots. If you want to own a building at the heart of the town, you have to work for it. But if you are lucky enough to own that tavern in the town square, you bet all those NPCs will flock to your events! Music is easily one of the most overlooked parts of any game. Done right, it can go by without being noticed in-game. But if it’s missing, the experience will never really captivate you. When I think back on the games I’ve loved over the years, they all share something in common – a memorable soundtrack. When working on Minecraft Frontiers, we understand that if we want our explorable places to stand out, they will need a soundtrack to accompany them. Whether you are walking around the capital, or fighting your way through a dungeon, the memories you keep should have the right flavour to them. Music lets us quickly express what the current setting means. Is it a dangerous area? Is this part of town full of rich politicians? Was this ruin built thousands of years ago? All these questions would take pages of lore to answer, but a soundtrack can do that in couple of seconds. The music plugin (MF Music, as we call it internally) has already gone through several iterations. We want our experience to be easily accessible by anyone – the music system has to be handled by your Minecraft client. Downloading an extra piece of software is a hassle the player should not have to go through. The early prototypes of the system were interesting, allowing us to play the custom soundtrack to our players, but they did not respond to the world at all. The main point of having music is to attach it to the world in a meaningful way. Without it dynamically adapting to the world, there is little point of putting all the effort in. Today marks the day when the system is complete and rolled out on our test server. In the current state, the soundtrack seamlessly integrates with our regions. Not only will you hear music based on which region you are in, the soundtrack is also able to prioritize a specific location. Are you in a tavern in the capital? The soundtrack will understand that being in a tavern overrides being in a town, selecting the tavern music. This allows us to define very specific areas in the world that will have a signature piece of music attached to them. Dungeons may be broken up into sections (or sections of sections, the inception potential is endless), giving you just the right song for your memorable boss fight. Next to that, the soundtrack is able to change on the fly. Coding all of our plugins internally means everything can dynamically respond to what is going on. The soundtrack is no exception. The songs attached to regions are not set in stone, but can change as the world itself is changing. Walking through town, doing your Sunday grocery shopping, will sound very differently than walking the same street during a bandit invasion. The current system is as flexible as any of our other features, able to adapt instantly to what the world is doing. All of our music was created by professional artists. When it comes to immersion, we strive for delivering something that will blow you away. Music is a big part of our experience, so we decided there would be no compromises. As a result, all of our songs are properly licensed. We are able to deliver great quality with no fear of copyright infringement. Trading is the core of our Economical simulation. With all of our plugins being designed in-house, we have the opportunity to create systems that are tightly linked to one another. Trading is no exception, as it seamlessly weaves into everything the players (and NPCs) do. Our Economical simulation is inspired by our real world, so this article may be a bit too heavy for some readers. At the same time, those who love trading and business will appreciate the depth we are going for. In a large majority of games, coins are generated by everything the player does – you kill a monster, it drops gold. You finish a quest, it drops gold. You sell your stuff to an NPC, it drops gold. In all of these situations, the gold is generated out of nothing, increasing the total amount of gold present in the game world. In other words, when you first start the game, no one has any gold. As players progress, the overall gold in-game increases with no limit. When you first start playing, nobody else has gold, so you can buy a lot with it – a house, the best piece of armor, a rare pet. As more and more people generate gold, the gold you have loses value. When everyone has 1000 gold, your 10 gold coins don’t mean all that much. A house no longer costs 10 gold (everyone would have hundreds of houses if it did). It instead costs 1000 gold. Is the house 100x better than before? No. So why is it more expensive? Your gold coins lost value. This is called inflation. To prevent inflation, games create money-sinks. If coins get generated out of nothing by simply playing the game, a money-sink is a system where coins disappear into nothing. This tries to provide balance by removing currency on one side, while it is being generated on another. A money-sink is similar to and admin shop: someone loses gold while no one gains it. An example would be purchasing a mount-riding license, paying transportation fees, or losing gold when you die. There are two big flaws with this system. First, it does not feel natural to earn money out of nothing. In the real world, if I get paid by my employer, it is out of the money they have. He is not magically printing it in his basement (hopefully). Second, as more people play the game and get better at earning money, the developers are forced to create more and more money-sinks to balance that out. As this never really works out, you still see rapid inflation in most games. Leaving an online game for a year, you'll come back to find your money worth next to nothing. The system we have tries to give you the feeling of meaningfully earning and spending money. Instead of magically generating money for everything the player does, we funnel currency into Elpida through trade. Trade is the process of sending items off shore, in exchange for currency. This is where the coins are magically generated in our world. Part of the coin goes to the player, while the rest goes directly into the town treasury through taxes. The money then stays in Elpida for quite a while. Players trade the currency between each other, with NPCs and with the town. This means a lot of the payments you make on a daily basis aren’t gold-sinks. Money doesn’t disappear, it just gets traded to someone else. If you go to an NPC and buy 10 expensive bottles of wine, they will have the money you gave them and spend it themselves at a later point. If you buy a land permit from the town, all of the money you spend will go into the town’s treasury. Likewise, if an NPC rewards you for your help, it will be from their personal bank account. This results in a much more connected environment, an environment that makes more sense intuitively and feels alive. By keeping the currency in the loop for a while, the way in which you spend it suddenly matters. If you do not buy equipment from NPCs, but instead blow your money on a fancy town house, that makes a lot of impact. NPCs will have less money to spend, while the town will have more. At the same time, if you don’t pay taxes and hide your money with your friends, the town stops prospering, while players get more money overall. Banks will not just be a place to store your coins, but elaborate institutions where smart bankers can keep or release their money based on currency value predictions. There are numerous ways your spending impacts the economy. A cry from one of the onlookers interrupts him. “Illness? He was poisoned!” The ensuing commotion drowns out Synedrus’s attempts to regain control of the crowd, and he stops speaking. Once the chorus of yelling dies down, he resumes his speech. “While we have no reason as of yet to suspect foul play,” he enunciates, glaring pointedly at the original troublemaker, “I can assure you that I will do everything in my power to determine the true nature of the Governor’s lamentable demise. In fact, I shall be overseeing the investigation personally before my departure for the mainland. It was indeed fortunate that, by a happy coincidence, I was in town at the time of his passing. I have known Senator Pertentus, for most of my life, and I do not intend for his death to go unpunished, if indeed there is reason for such punishment.” Here the Auditor pauses to look searchingly at each member of the audience, as if daring them to have had any involvement in the Governor’s passing. “R-restructuring?” inquires a frail tribune standing nearby, an indignant expression upon his face. “The council would never—” Synedrus sighs as the crowd once more dissolves into chaos. Perhaps it is best to end this speech before a mob forms. At least his primary duty has been fulfilled, and there is much work to do before he can return to civilization. The Auditor departs the podium amidst a cacophony of shouting and hurries off before anyone can grab his attention. Politics is a complicated field. You have to balance the needs of many competing groups all while furthering your own agenda and making sure you don’t upset the general public. Radicals aren’t appreciated in politics, and are usually met with hostility, and a losing election. People who stick with the status quo are prided because no one wants the delicate balance upset. In Elpida, the role of a politician is no different. Elpida has a political triumvirate running the colony. Each member of the triumvirate is responsible for dealing with a section of the colony’s duties. The economic conditions, including how trading occurs, what taxes are associated with it, and how heavily ordinary citizens are taxed, are primarily controlled by the Minister of Trade. All parts of the justice system, from controlling the town militia to serving as the chief judge fall under the duties of the Executive Magistrate. Lastly, charged with managing urban construction, town expansion, and housing is the Prefect. But just telling you about the positions running the colony of Elpida isn’t any fun. I mean, politics is for rich people and probably controlled by the admins right? NOPE. Following the start of the server, an election will soon take place to determine the next three members of the triumvirate. Running for a position will require a certain reputation with the town of Elpida, and enough money to campaign for yourself. After a registration period, voting will open up to all members of the server (residents of Elpida) and the votes will be tallied up after a few days. The winning candidates will then be put into office and given control of their respective position. Of course, you’ll have a lot of responsibility as a politician. Being a politician is a full-time job and lack of dedication will lead to losing the next election or even being prematurely being removed from your position (angry mobs are not good things to have outside your house!). Excited yet? Good! Don’t forget to sign-up for our newsletter as we give out free gifts and sometimes secret information on them! Let’s talk about a feature that many games underestimate – Crafting! I've played enough roleplaying games to know one thing: there are a lot of people who love crafting. Not everyone wants to be a brave dungeon crawler. Sometimes it’s more fun to be a blacksmith or a baker. Sadly, in the majority of games, the only real way of becoming famous is to find a dungeon and loot some treasure. This leaves all the bakers in the shadow of the warriors, greatly unappreciated by the system. What’s more, crafting often doesn’t give people the depth one would expect. You have hundreds of creature spawns to choose from when you decide to kill stuff, but when you want to be known for making swords, you have to make the same sword over and over again. If the system is complex enough, after making a hundred of those swords, you might learn a “better version”. In our world, a crafter will have the same level of importance as a warrior, politician or explorer. You will never be in anyone’s shadow and they won't be in yours. Each play style will have a range of meaningful decisions to make on a daily basis. The crafter is no exception. We recognize that many games don't give crafters the range of options they deserve. That is why our server offers fully custom, multi-step recipes. What does this mean? Whenever you want to craft an item, you will have to learn how it is made. This is not done by clicking some arbitrary buttons, or bribing an NPC. Learning to craft an item requires that you as a player understand the recipe. If you are making a sword, you have to know what parts it consists of, how to make those parts, and what tools to use in the process. Basic recipes can be learned from NPCs or books (sort of a crafting cookbook). These will only teach you how to make the basic items – simple bread, wooden or iron swords, rough leather armor. To learn the recipes for better items, you'll have to spend your time getting to know the NPCs better, getting the master crafters to trust you in order to learn their secrets. Often times NPCs won’t even know the recipes themselves. This is where explorers come in handy. They will be able to find you information on ancient crafting techniques that will be useful during crafting. They might also be able to travel to distant places, learn how things are done in other lands and then share that knowledge with you. It is fairly easy to get into crafting. Simple recipes will not require you to know every little corner of the game world. However, we can promise you that no recipe will be as simple as combining two items together. Every item consists of parts that also have to be crafted. This means your crafting process will consist of multiple steps. Take a wooden sword for example – the most basic of weapons. You will learn that a wooden sword consists of three parts – a wooden hilt, a wooden guard and a wooden blade. You will need to craft these items in order to make your sword. This will give players the opportunity to spend their crafting time doing a variety of tasks, not simply combining the same things over and over again. As you get more elaborate, the high-quality recipes will require you to combine a range of different parts together, many of which will not be made at the same crafting station. Killing monsters will never drop a finished item. A politician will rarely be able to obtain something he can use straight away. Instead, most dropped items will be crafting ingredients used in recipes. This means warriors may be able to find a basic weapons, but without the help of a talented crafter, they will never have high-quality gear. At the same time, crafters will not be able to craft high quality items without the ingredients found by warriors. This creates a deep, connected system between players. If people want to truly prosper, they will soon learn they all need each other. Basic weapons will be created using basic, harvestable ingredients. The more elaborate you get, the more players you'll need to know.